Today's blog post is a short one, but its the first of several similar postings that I hope to share with you throughout the year. The topic is strange, creepy, and spooky art...of course, with a paranormal flair to it! 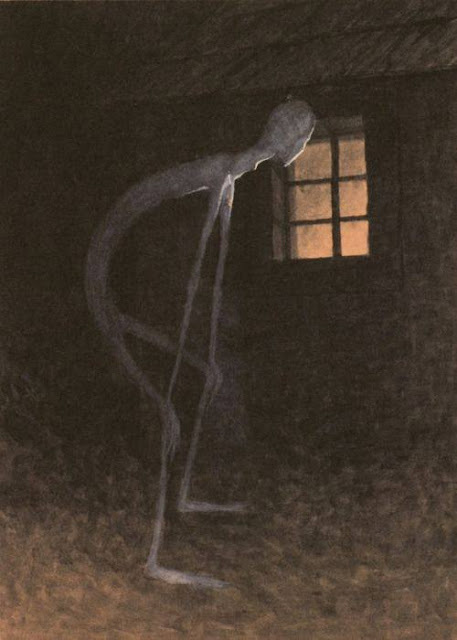 The painting below is entitled Death Looking into the Window of One Dying (1900) by Czech artist, Jaroslav Panuska. Panuska was born in 1872 and died in 1958, and while many of his paintings are mundane landscape-type scenes, a handful are rather unique and arguably downright creepy! For more of these creepy works by Panuska, please check out the Monster Brains blog!